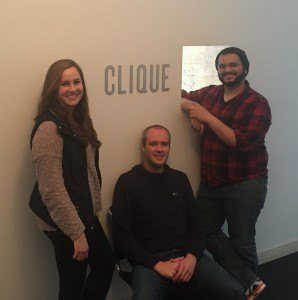 Clique’s inaugural Modern Apprentice Program (MAP) kicked off last week with three amazing apprentices. MAP is an intensive 3 month program to train new engineers on our unique process to develop enterprise websites and applications. At the end of the week, each took some time to reflect on their first week. The first and last week of an experience are always the most interesting to me. They both harbor a unique collection of feelings that the other weeks can’t replicate. You almost touch on the full emotional spectrum, and that’s okay. This is how you become great at what you do, you don’t avoid emotions, you welcome them. Being born (into the programming world) a rails developer and now having to learn a new set of languages and frameworks can be daunting. But wasn’t learning to program in first place daunting? how about Geometry? walking? speaking? We have been learning our whole lives, and this is no different. I appreciate the opportunity that Clique has provided me and I must repay them with bringing the drive to create with me everyday. I was fortunate to be selected to participate in this program and bringing anything but top tier curiosity would be a mistake. Knowing what you don’t know is the first step in a long fulfilling journey. Along with all types of nervousness that goes with jumping into something completely new, I was the most anxious for the technical components of coming to Clique. I was curious about whether my skills in Ruby were as transferable as I had been told by more experienced developers. I had done the prep work on Team Treehouse about PHP and felt good about the syntax. Even with this boost of confidence, I was ready to see how it would really go once I had to tackle more complex problems. After setting up our environment, we jumped right into creating a CRUD app. The goal was to add, edit and delete users. This was something I had done many times before in Rails and Sinatra. Now it was going to all be in PHP. Even with the concept being familiar, what threw me the most was that we weren’t using any framework! Even with the unfamiliarity of building a CRUD app without a framework, I was able to connect to the database, run commands to interact with the database and display all my content on a web page using PHP. Throughout creating this small app, there were definite feelings of confusion. It’s easy to get intimidated when everything looks and feels unfamiliar. In instances of self-doubt, I kept telling myself “you know how to build this, you’ve done it before. You are building the same application just with totally different pieces.” This project reinforced for me to rely on what I know and to use this base knowledge to always explore what is new. Throughout Week 1, I have definitely experience how my skills as a Ruby developer are applicable to building in PHP. My main concern going into week one was my technical level with PHP. I was told the same concepts from Ruby apply to PHP but I was still concerned as it was a new programming language to me. Above all else I did not want to fall behind in week one and have to continuously play catch up. One of our first projects that required PHP was to build a calculator. I was concerned at first because of all the logic that goes into programming a calculator, but quickly realized this is a great way to become more familiar with the PHP syntax. The calculator ended up being a tough challenge but one I learned a lot from. I have a good grasp of switch statements in PHP and am becoming more familiar with classes and methods. As an added bonus I increased my jQuery knowledge, as it was required to make the buttons on my calculator respond to a mouse click. Overall week 1 really helped solidify basic PHP concepts that I know will be crucial to the weeks ahead.